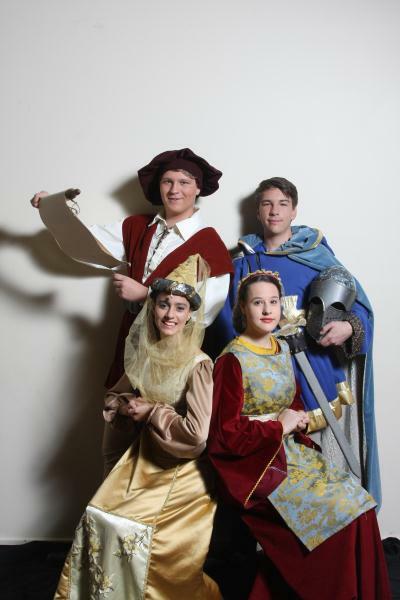 ACTING UP: GSODA juniors, at back, Michael Dimovski and Jacob Shears and, at front Anthea Tsataronis and Nina Chivers star in Once Upon a Mattress. DEBBIE Fraser can name drop with the best of them: Guy Peace, Portia De Rossi, Chrissy Amphlett, Peter Colman-Wright – even Geelong’s venerable mayor, Keith Fagg. They are all alumni of GSODA junior players, a theatre group that has been working continuously for more than 50 years. And for most of that history Debbie has been in the thick of it, performing as a teenager and later in production, be it props, scenery, costumes or makeup. She’s one of a group of volunteers who have kept the company not only going but thriving. “There would hardly be anyone involved in any of the local theatre companies who didn’t get their start in GSODA juniors,” Debbie mused. “There are former GSODA juniors in the arts department at the City of Greater Geelong, technical people at the Courthouse, in Doorstep, Back to Back, they all started as juniors. Managing 65 teenagers every year is a challenge, Debbie admitted. Debbie said the junior company was open to anyone who wanted to participate. “We run a workshop every year for about 30 and take around 65 into the main company. Kids can audition for a place or audition for specific productions. Debbie noted the popularity of GSODA juniors in such a sports-oriented city. Debbie said the experience taught young people how to work as a group while retaining their individuality and creativity. “It encourages them to be free-willed and express themselves while demonstrating the commitment needed. “It’s about life skills, camaraderie and self-discipline, great things that help you no matter what you do in life. “People stop me in the street and recall their junior players experience or tell me they achieved something because of the confidence they received as a result. “My greatest joy is passing on my skills to others. It was behind my choice to stay in Geelong. Geelong Peforming Arts Centre hosts Once Upon on 22 June. More informaiton about the group is available at gsoda.com.au/Juniors.